The grapefruit is one of the oldest citrus fruits in existence but its origins are still a mystery! It appears to originate from an unusual cross-breeding between orange and pomelo, an ancient fruit which, together with the citron and the mandarin, represents the oldest form of citrus fruit. Its scientific name is Citrus Paradisi, meaning paradise fruit. The grapefruit is an evergreen plant that can grow to around 15 meters tall. It produces intensely fragrant flowers perfectly round fruits with a light yellow skins. There are numerous varieties of grapefruit, but after the yellow variety, the pink grapefruit is by far the most commonly used. As is the case with all citrus fruits, the grapefruit is rich in Vitamin C: 75% of its flesh is juice, meaning it is able to preserve all its Vitamin C for a number of days. The grapefruit has a distinctive bitter taste and is ideal eaten as it is, or in savoury recipes or squeezed to make a thirst-quenching drink. Its name in English is derived from the shape of its fruits on the tree, similar to bunches of grapes. The grapefruit should not be confused with its closest cousin, the pomelo. Although they are very similar citrus fruits, there are substantial differences between the two. Grapefruit are smaller in size and the peel is slightly less thick. 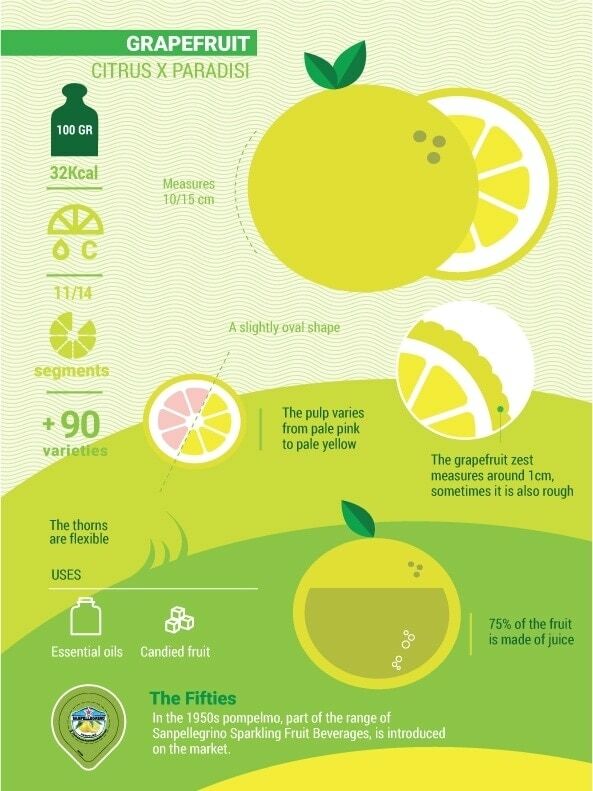 In grapefruits you can find up to 12 segments, while for pomelos they vary between 16 and 18. The pulp of the grapefruit is very soft and juicy, and its fruit is generally clustered, not individual. The grapefruit harvest period is particularly long, and in certain climatic factors, can even last all year. After its maturity, grapefruit are well-preserved on the plant and their growth is prolonged for a few months.